To make them slightly less sweet, use plain yogurt. For a sweeter pop, use vanilla yogurt. You can also make these with either Greek or regular yogurt, whichever you prefer. You can also add protein powder for an extra energy boost. 1) In a small saucepan, combine frozen Wild Blueberries, maple syrup, lemon zest and chia seeds. Bring to a boil, then lower heat and simmer for 10 minutes, stirring often and smashing berries with a spatula to make a chia jam. 2) Remove from heat, transfer to a bowl and stick in the freezer for 15 minutes to cool. 3) Place yogurt in a bowl. Mix in protein powder if using. 4) Add Wild Blueberry mixture to the bowl and stir lightly. The less you stir, the more of a swirled effect the popsicles will have. 5) Gently spoon into popsicle molds. Add sticks and freeze. 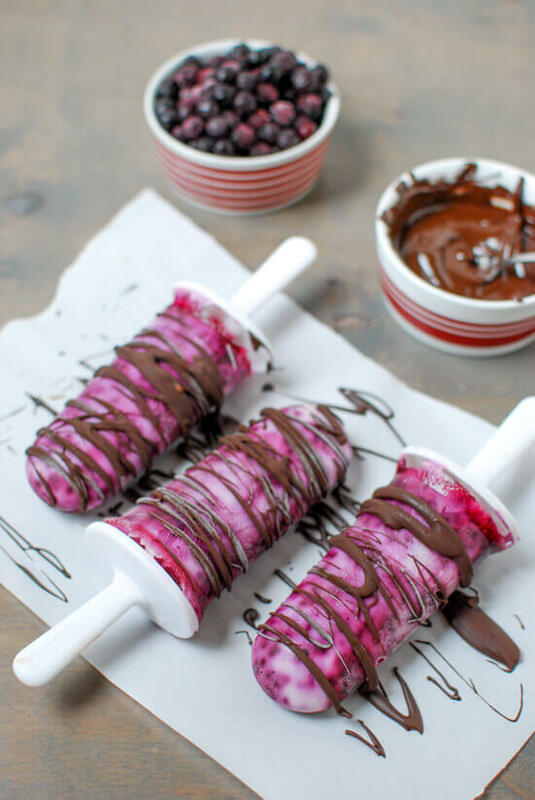 6) Optional – once frozen, melt chocolate chips and coconut oil, remove popsicles from molds, place on a plate and drizzle with chocolate.